The exoplanet 55 Cancri e falls into a new category of super-Earth with a composition that suggests such alien planets might be rich in rubies and sapphires. A newfound kind of super-Earth alien planet might glitter with rubies and sapphires, a new study finds. As researchers have discovered worlds around other stars, one class of these exoplanets that popped up was the super-Earths: rocky planets that can reach up to 10 times the mass of our own. Much remains a mystery about super-Earths, since none are known in the solar system. 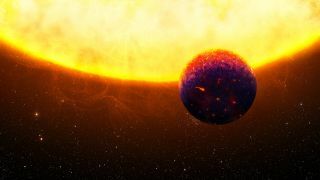 Now the researchers suggest they may have discovered a new class of super-Earth — one that's rich in sapphires and rubies. "We showed that the compositional diversity of planets — super-Earths in particular — might be much larger than previously thought," lead study author Caroline Dorn, an exoplanet scientist at the University of Zurich in Switzerland, told Space.com. Scientists conducting previous research have often thought of super-Earths as rich in iron, much like Earth, Dorn said. These would have formed in the cooler parts of protoplanetary disks. However, Dorn and her colleagues suggest this new type of super-Earth is loaded with calcium and aluminum, as well as minerals rich in these elements, including sapphires and rubies. These planets would have formed in the hotter parts of protoplanetary disks. The scientists calculated that this new class of super-Earth should be 10 to 20 percent less dense than Earth. Moreover, they noted previous research has discovered super-Earths that match this description. For example, Dorn and her colleagues examined the super-Earths 55 Cancri e and WASP-47 e, which prior work suggested had unusually light densities. One potential explanation for these low overall densities might be that they have thick atmospheres, but they discounted that possibility, since the planets orbit their stars so closely they are extraordinarily hot, which makes it likely that any thick atmosphere they had would have evaporated away long ago. A third previously studied planet, HD 219134 b, appears to have this composition as well. "Given our models and the observations, there are good chances that the studied planets have very different interior compositions compared to the majority of super-Earths," Dorn said. The scientists detailed their findings online Dec. 18 in the journal Monthly Notices of the Royal Astronomical Society.